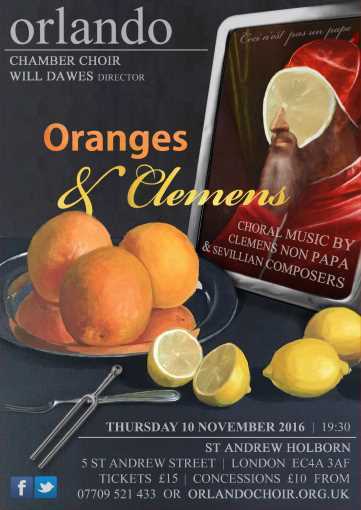 Orlando Chamber Choir presents a fruity programme with works by Jacobus Clemens non Papa, the 16th century Netherlandish composer whose name sounded confusingly like that of a pope, and by his illustrious contemporaries from Seville, the Spanish town well known for its oranges. The start of the concert will be sonorous and strong, with works for and about the rulers of Europe at the time, Charles V and Phillip II, whose global territories “on which the sun never set” included the Spanish Empire and the provinces of the Netherlands. Alonso Lobo’s Lamentations, rediscovered in an 18th century choir book at Seville Cathedral, are at the zenith of the programme. Serene and contemplative, these meditations are a shining example of Renaissance polyphony. After some Spanish wine and the interval bells of St Andrew’s, the evening will continue in more tender tones, with texts set to the biblical Song of Songs and compositions honouring the Virgin Mary and Mary Magdalene.